Some people start growing their tomatoes with tomato seeds. Others start with tomato seedlings. So which option is right for you? Here are some tips and thoughts that might help you decide. 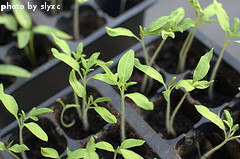 Tomatoes are usually planted in the garden using transplants. A transplant is a seedling plant that is grown from seed in a small container. That plant is then transplanted from the small container into your garden. 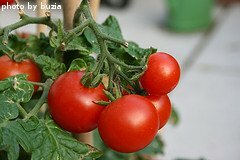 Tomatoes are generally not successful if the seeds are planted directly in the garden. You can purchase seeds and/or seedlings at your local garden shop, hardware store or large home improvement store. If you choose to buy tomato seeds and grow your own seedlings, there are several factors to contemplate. It will take 6 to 8 weeks to grow a transplant from seed. Ideally, you'll want to start this process approximately 2 months before you want to plant the seedlings in your garden. Like everything else in this world, there are advantages and disadvantages to growing your own transplants from seeds. The advantages - you have many more varieties of tomatoes to choose from. A typical retail store might carry just a couple of varieties of cherry tomatoes, paste tomatoes, heirloom tomatoes and maybe 6-8 different varieties of regular tomatoes. However, if you grow your own transplants from seeds, you can choose from hundreds of different varieties from online seed catalogs, garden shops, etc... You also control how the tomato seeds are planted and how the seedling is fertilized and cared for before transplanting it into your garden. This is especially important if you intend on growing organic tomatoes. OK, so now for the disadvantages. If you want to grow your own seedlings, you'll need to buy additional supplies, such as flats, small containers and potting soil. You'll also need to do a little bit more work - planting the seeds, watering them, transplanting the seedlings from a flat to a small container, etc... Another disadvantage is that you will need a suitable place to grow your seedlings, which is usually indoors. The location you choose should get plenty of sunshine and be fairly warm. A sun room works well. If you don't have a good location or don't want to put up with the mess of growing plants indoors, you should strongly consider buying seedlings. One good option for starting tomato seeds is a greenhouse. It not only helps you get a head start, but it also can extend your growing season for all kinds of plants. For some great greenhouses, check out our friends at Solar Gem Greenhouses. If you choose to grow your own tomato seedlings, here are the steps you need to take. First, go to the store (either online or brick and mortar) and purchase the seeds you want to plant. Make sure to read the seed packets to determine if the tomato varieties you choose will grow in your geographic area. You will also need to purchase a bag of potting soil (top soil also works well). You'll also need to purchase flats. These are plastic trays that have several, very small planting containers attached to each other. Most flats have 6-12 containers. Additionally, you will need to purchase pint sized plastic or Styrofoam cup-like containers. They should have holes in the bottom so that excess water can drain out. Plastic, disposable picnic cups can work well as a substitute for these containers (just make sure to poke holes in the bottom). Once you have these supplies, you are ready to begin planting the tomato seeds. Fill the flats with potting soil, leaving 1/4 inch at the top. Put 2-3 seeds on top of the soil in each container and cover them with potting soil. Water the flat until the soil is good and moist. Put the flat in a warm location with plenty of sun. Continue to water every few days, making sure the soil stays moist, but not waterlogged. Once the seedlings are 1 inch tall, thin to 1 plant per container in the flat. When each tomato seedling reaches approximately 2 inches tall, it's time to transfer them to the small cup-like containers. Put 1 1/2 inches of potting soil in the bottom of the containers. Carefully remove a tomato seedling (roots and soil too) from the flat and place it in the middle of the pint size container. 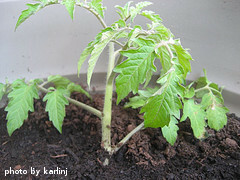 Fill the remaining space with more potting soil, going to the top of the root ball of the tomato plant. Again, water the containers thoroughly. Leave the containers in the same warm, sunny location. When the tomato seedlings are 4-6 inches tall, they are ready to be transplanted into the garden. If you weigh the options and decide that growing tomatoes will be easier if you purchase the seedlings directly, it's important to purchase the best seedlings you can get your hands on. Choose those seedlings that aren't wilted and that don't have any black or brown spots on the leaves or stems. You should also try to choose containers that only have one seedling per container. The plants you choose should be 4-6 inches tall and have several leaves on them. If you don't see any seedlings that look good to you, ask a store employee when they will be getting in another shipment of plants. The sooner you are able to arrive at the store after the shipment arrives and is put on display, the better your chances of finding good, strong seedlings. If you want to purchase seedlings that are currently growing in flats and are 1-2 inches tall, that's fine and usually a more economical option. Ideally, you should replant them into small, cup-like containers and let them grow to 4-6 inches tall before transplanting them into your garden. A tomato transplant that is 4-6 inches tall when transplanted into your garden will have a much better chance of surviving and producing high quality and high quantities of fruit, as opposed to a seedling that is only 2 inches tall when transplanted. However, we've transplanted many tomato plants over the years from flats directly into our garden and most of them have done just fine.